Kate and her little ones recently visited the United Kingdom where they popped over to London and visited many spots like the London Transport Museum, Natural History Museum, Paddington Station, London Zoo, Green Park, London Eye, Science Museum and couldn't stop talking about the Postal Museum and I must say it sounds and looks amazing. I wish the UK wasn't so far, we would pack our bags and go tomorrow! Thanks for the fab review and pics Kate x To follow and see what Kate was up to in the UK, checkout her Insta page @kateflatman. When I first read about The Postal Museum, I knew that we would have to put it on our list of places to visit when we were in London. The Postal Museum is so much more than a traditional museum; with two interactive exhibition galleries, a dedicated family play space plus Mail Rail, a subterranean train ride that follows London’s 100 year-old underground postal delivery network, this is an experience that really does offer something for the whole family. Here's our highlights from the Postal Museum. Who wouldn't love an opportunity to whizz around on tiny trains through tunnels deep under the streets of London?! One hundred years ago, a secret railway was built under central London. Stretching six-and-a-half miles from Paddington to Whitechapel and linking post offices across the city, the driverless electric line carried up to four million letters a day! But in 2003, after 75 years of service, this wonder of engineering was shut down. Lucky for us Mail Rail has recently reopened with tiny trains running through the tunnels again but this time they are carrying people rather than sacks of mail. During the 15-minute journey, that’s deeper than the tube, visitors ride on one of two new trains, near-replicas of the originals but with (slightly) padded seats and better suspension. The trip is not for the claustrophobic. The tunnels were never designed for human cargo so there’s not much room to move once inside a car. The ride is narrated by your guide and ex-mail rail employee, Ray Middlesworth and makes several stops. Movies are projected on the walls that show how the rail to the sorting facilities worked. There is one section when the train pretends to break down in order to replicate the frequent power cuts that afflicted the real track. It only lasts for a few minutes but I am glad that we pre-warned the poppets it might be dark as they did get a little freaked out. Be sure to look down through an arch into a lower tunnel, tightly packed with old sleeping trains. The old engineering depot, where the ride kicks off, has been converted into an exhibition space all about the history of the Mail Rail and the people who made it all possible. There are plenty of interactive displays for younger kids, including a real-life travelling post office complete with shaking floor. Designed for children aged 8 and under, Sorted! 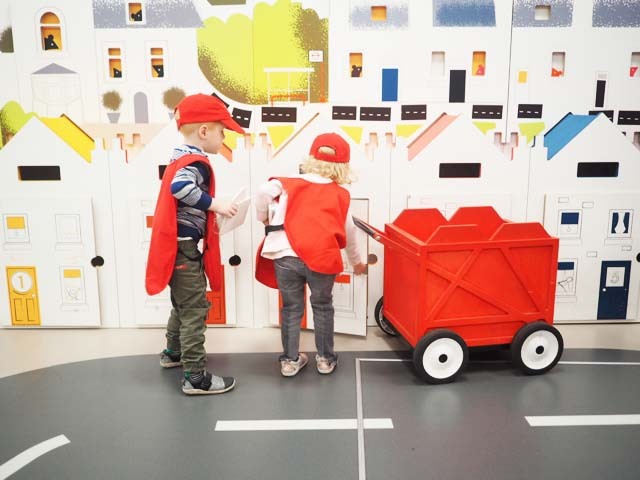 The Postal Play Space is a fun, interactive play area designed as a miniature town for little ones to exercise their imaginations and use up excess energy. Children can play with postal trolleys, slides, parcel pulleys, letter chutes and pretend to drive a wooden vintage post van. During your 45 minute session, little ones can even take on roles as cashiers or customers in a mock-up post office, or work out the best way to deliver parcels to a mini neighbourhood of roads and houses. The Postal Museum itself, on the opposite side of the street, has an exhibition showing how the Royal Mail developed from transporting letters ordering troop movements by horse for Henry VIII in the 16th century to the present day. Like the Mail Rail exhibition, the Postal Museum does a great job of integrating interactive displays for little ones. The poppets particularly loved watching the pneumatic tubes whizz over their heads and making their own personalised stamps with our faces on them! Save time and secure your place by booking your tickets online before you visit. Look out for special ticket offers throughout the year to save on entry. 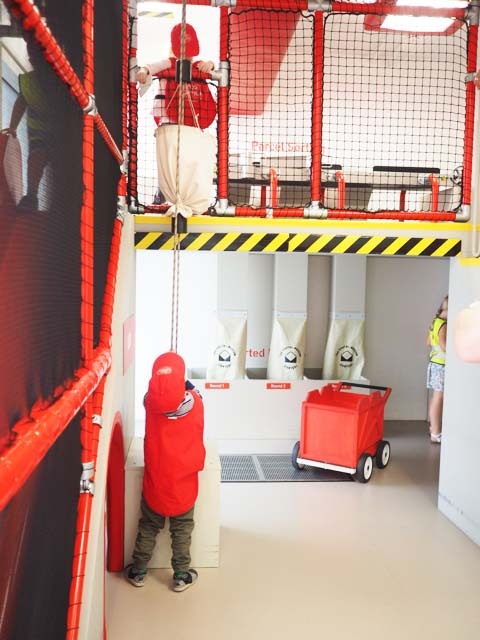 With younger children, allow approximately 2 hours to visit The Postal Museum Exhibition, Mail Rail Exhibition and the Mail Rail ride (which lasts approximately 15 minutes) + time for morning/afternoon tea or lunch. The Postal Museum is split into two separate areas: Mail Rail, Mail Rail Museum and Sorted! are on one side of the road and The Postal Museum (and Cafe) is on the other side of the road, diagonally opposite. The onsite Counter Cafe, serves a variety of (healthy) light snacks, lunches, cakes and drinks. If weather and seating permits. the super cute postal themed courtyard is a great place to enjoy an ice cream from the ice cream cart. Highchairs are also available. The Postal Museum and main level of Mail Rail is completely accessible with a pram and although prams are not permitted on the Mail Rail ride or lower ground/exhibition level, there pram parking space on the ground floor. Baby change facilities and lockers are also available. Busy City Kids were invited to the Postal Museum in London for the purposes of a review. All opinions & feedback are genuine & truthful. Travel, food and fee paying activities were self funded. For more information on the Postal Museum in London, head to their website.